Here is a brief summary of a webinar I attended on the 20% small business deduction. 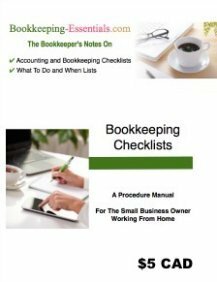 AdminBooks hosted three free webinars in July and August of 2018 to help educate and navigate the new tax laws and how they may impact your situation. None of the information presented in any of their webinars is to be construed as specific advice for your individual situation. It is presented for educational purposes only. Please contact AdminBooks if you wish advice pertaining to your specific situation. Renee Daggett EA is the President of AdminBooks and the author of "Your Financial Flight Plan: Pilot Your Business to Profitability". Based in California, the AdminBooks team helps small businesses be responsive to complex and specialized issues that affect your business such as changes to tax law, software, compliance or employment laws. Who qualifies for the 20% small business deduction? C Corporations do not qualify. The qualified small business income deduction is a deduction from Aggregated Gross Income (AGI), before taxable income for specified service trades or businesses. It is allowed on up to 20% of Qualified Business Income (QBI). QBI is defined as business income minus expenes ... i.e profit. QBI does not include capital gains, dividend/interest income, employee wages, owner/partner draws, money generated outside the U.S..
Only specified service trades or businesses qualify where principal and/or skill is the principal asset. These include but are not limited to health, law, accounting, actuarial science, performing arts, consulting and financial services. 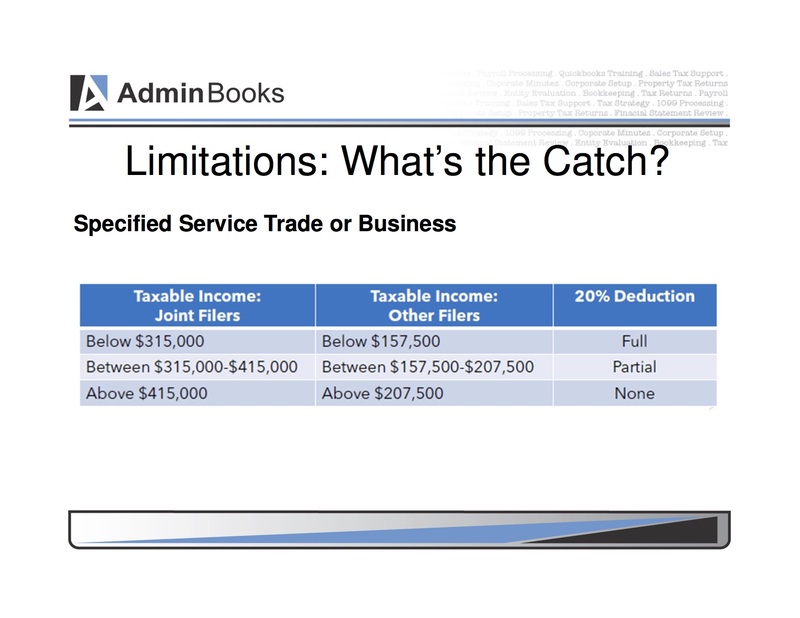 There is no deduction unless taxable income is below certain thresholds. This means that if taxable income is over $415,000 ($207,500 for non-MFJ*), no deduction is available. 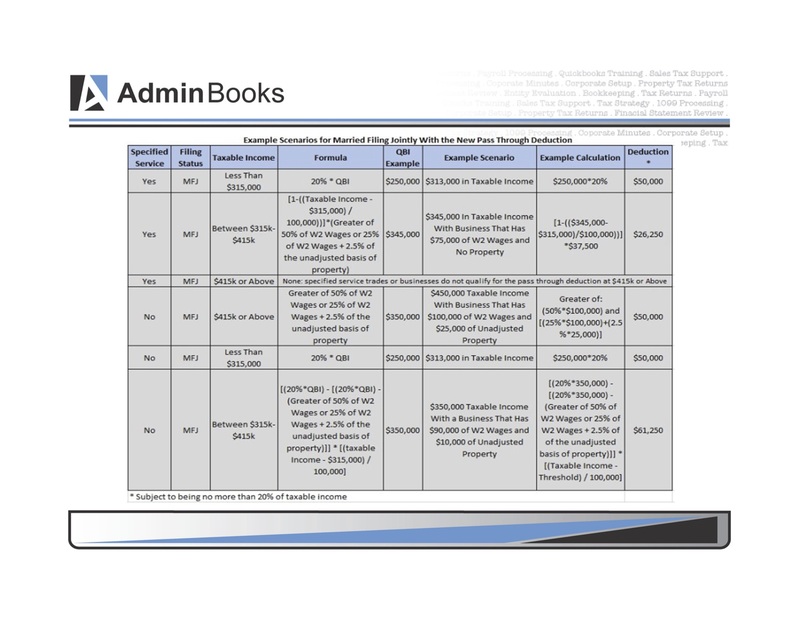 See the AdminBooks slide below for the thresholds. (b) 25% of W-2 wages plus 2.5% of taxpayer's share of basis of "qualified business property"
... BUT it only applies at certain taxable income levels. Three general situations possible are (1) have no wages but hold property, (2) have wages but no property, or (3) have wages and property. 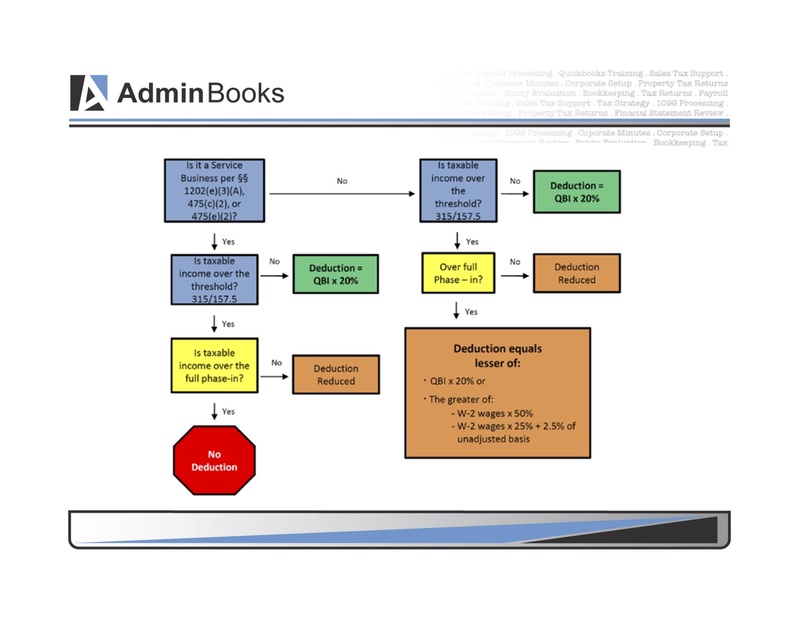 See the AdminBooks summary slide below. Renee and her team can help you determine if it makes sense to change your entity structure ... or if you should convert 1099 contractors to W-2 employees. It is not a given as bumping up wages might increase your deduction but it may not be offset by the higher payroll taxes. 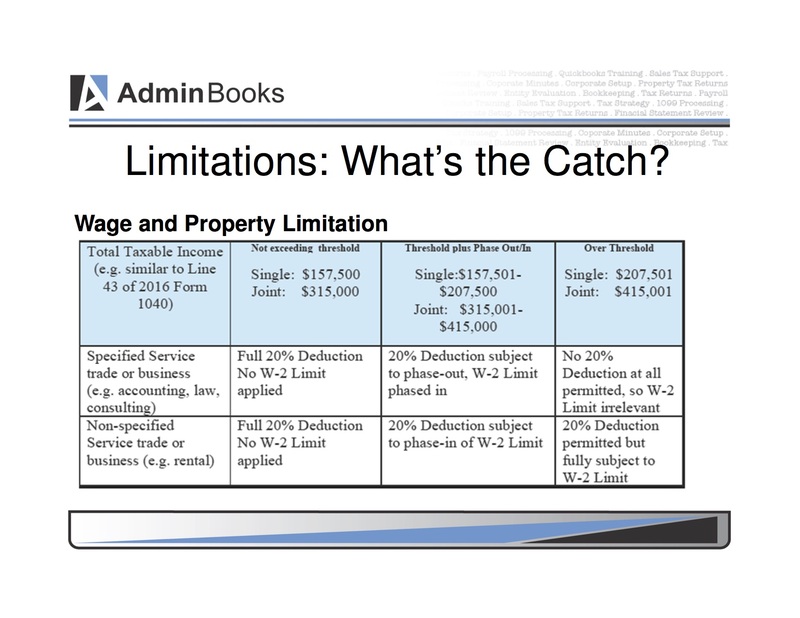 You can ignore the limitations if your taxable income is below $315,000 / $157,500 as you are eligible for the full deduction. 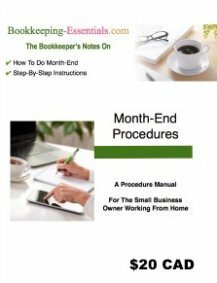 AdminBooks can also help you strategize ways to keep your taxable income below the thresholds. Keep in mind ... you must still calculate your self-employment taxes on net business income BEFORE the 20% small business deduction. Identify your QBI for EACH activity. Compute the initial 20% deduction for EACH activity. Apply wage and property limitations for EACH activity to compute a tentative deduction. Combine the tentative deduction from EACH activity. Limit your overall deduction to taxable income less net capital gains. And finally, here is a great overview depicting various scenarios with the small business deduction.